Material/Waterproofness/Breathability: The Craghoppers Downpour jacket is made from Aquadry Fabric with inner mesh lining. 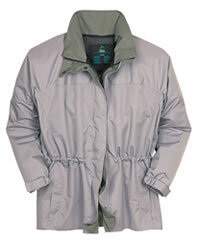 Is waterproof, windproof (tested on the cross-channel sea-cat!) and breathable. Soft to the touch and lightweight, it folded away well into a small day pack. Overall Design: Very attractive and stylish. Equally suitable for 'about town' as on the hills. Double folding storm flaps over front zip, unobtrusive adjustable hem, waist and hood cords. Fit: Tester: female, 5' 4'', average build. Very comfortable and roomy without felling voluminous! Plenty of room and flexibility around the shoulders. Zips: Main zip goes the full length of the front with double folding storm flaps. Top of zip protected so it will not scratch your chin. Two zipped external hip pockets and two zipped internal pockets. Pockets: External pockets are a little shallow. Zipped with velcro flap (the Velcro keeps attaching itself to the velcro cuffs (see below) which was really irritation. Internal zipped pocket holds a folded OS map comfortably. Second zipped internal pocket inaccessible unless jacket is undone. Hood: The Hood has a wired front, and two way volume adjuster allows snug fit whilst maintaining good visibility. Front toggles are well placed inside the storm flap of the front sip so they do not fly up and hit you in the face during high winds (see 'sea-cat' above). Hood folds away into collar and fastened with velcro. Cuffs and Collar: The cuffs are adjustable via Velcro fastenings (but the velcro keeps catching the pocket velcro - see above). Care and Maintenance: The usual care symbols listed on a label inside the jacket.